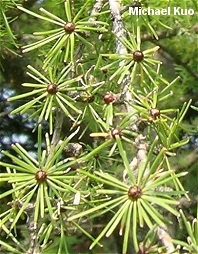 Conifer in swampy northern areas with deciduous, tiny needles emerging in clusters from lateral branch-spurs; cones under 1 inch long. Habitat: In boreal bogs and swamps; extending farther north in range than any other North American tree. Stature: To 60 feet tall and 2 feet wide; with an open, irregular crown. Needles: Just over an inch long; very thin; in clusters of 10-20, emerging from lateral branch-spurs--or sometimes emerging directly from branches, in tight spirals; turning brown and falling every year. 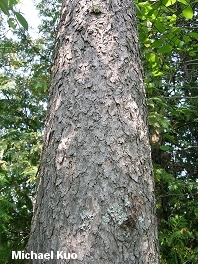 Bark: Thin; reddish brown; smooth becoming scaly with age. Cones: Under 1 inch long; brownish. Suillus cavipes and several other species of Suillus are exclusively mycorrhizal with tamarack. 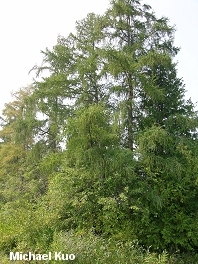 Trichaptum laricinum is exclusively associated with the deadwood of tamarack.